Land Development Engineering (LD Eng) was established in 2015, with just four employees. In just two years the business has grown to 22 employees (as of 2017) with an impressive portfolio of land development projects around Victoria. Today LD Eng has over 75 years of combined industry experience in land developments, infrastructure and drainage projects. 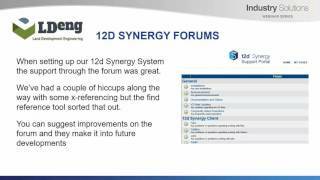 Steve Hodgson guides us through 12d Synergy as a quality Assurance solution. As a newly established business, gaining ISO 9001:2015 accreditation was a challenge. Without any project history it was impossible for LD Eng to provide any documentation to pass the required quality assurance audit. The business needed a rock-solid quality assurance system which would provide the basis of their accreditation. They also liked the thought of a modern system that could offer flexibility, and provide a competitive advantage. They weren’t impressed with solutions they had used in the past. “I worked from home a couple of times in my previous employment, but because the companies used File Explorer for their document management, and VPN connections to connect to the server, it wasn’t very practical,” explains Steve Hodgson, Director LD Eng. Steve had seen a range of workarounds to enable flexibility, from leaving a computer running in the office and using a TeamViewer app, to VPN and copying files to hard drives. None of this was ideal. VPN wasn’t great when downloading and uploading files, which made working on 12d Model projects almost impossible. Everything from email to CAD was stored on a physical server in-house, which meant that every time someone saved a file the data transfer would slow everything down. LD Eng wanted a reliable system that could provide their business with flexibility and peace of mind. After researching different options, LD Eng chose 12d Synergy as it ticked all the boxes. They implemented 12d Synergy from the very beginning, using it to manage the entire business from a corporate management level right down to general documentation. LD Eng now have a full digital paper trail of their documents, data and project related correspondence. Out of the box 12d Synergy will record each version change, who made the change, and what time the change was made, as well as a complete email correspondence and transmittal log. This process was crucial to their ISO accreditation audit, and proved they had the systems in place to acquire their accreditation. “The external QA auditor made mention in the report for Accreditation that our process for controlling the documentation of the systems was very well managed, a credit we give to 12d Synergy,” Steve noted. No VPN is needed for working remotely, 12d Synergy provides users with access to all of their files on the server from a remote location, provided they have internet access. 12d Synergy’s intelligent data transfer and remote access were the catalyst for introducing flexible working. Data transfers via WAN were dramatically improved. Now with the NBN, the LD Eng team have reported that working remotely is just as quick as being in the office. The system has transformed the way LD Eng staff work. At least 1-2 people work from home every day now, and most people will work from home 3-5 days a month. 12d Synergy has also enabled people to leave the office earlier for family commitments, and catch up on any remaining work at home. Steve himself swims twice a week in the morning, starts work at 10am, and makes up the time at night. Staff have a better work life balance, and LD Eng is already enjoying higher productivity. Steve was really impressed with how seamless the system ran. “With 12d Synergy, because everyone is essentially working locally on their own computers through Check in/Check out, there’s no difference between working in the office and at home, or on site. The industry at the moment is running hot and there’s pressure from all angles to get work completed, so the easier we make it for our staff, and the more trust we put in them, the better they perform,” Steve says. 12d Synergy’s check in, check out version control system leaves a clear and complete audit trail so changes aren’t lost, and older versions don’t get mixed up with newer ones. Even if a project needs to be traced years later, it can easily be accessed. 12d Synergy’s remote access and intelligent data transfer means that the LD Eng team can work from anywhere, anytime. With 22 staff in the team, at least 1 or 2 people will be working from home at any given time. LD Eng is growing rapidly, making it important to hire and retain quality staff. Previously, some staff were commuting well over an hour to work every day. 12d Synergy has enabled them to work remotely while management can still keep tabs on all the projects. They also have the opportunity to draw in the best staff available, not just the most conveniently located prospective staff. We would love to show you how 12d Synergy can adapt to your organisation, and provide you with the rock-solid quality assurance system which you require. Click below to reserve a time for an obligation free demo of 12d Synergy.